America has 5% of the worlds total population but has 25% of the world’s prisoners. The US incarceration per every 100,000 people is 450% higher than the rest of the world. America’s incarceration rate also disproportionally effects minorities as 1 in 3 black men and 1 in 6 Latino men will go to jail. Despite this problem being relatively new, it is deeply rooted in American History. I live in a community that is directly impacted by this problem. I walk the streets of Oakland, seeing two men greet each other quickly, one leaving with a green bill in their hand and the other left with a bag full of an unknown substance. I’ve watched as a black car with police written on the side slowly drive through my neighborhood and “patrol”. I choose to believe they do it to protect me but it is becoming harder to make that decision. The rates of arrest are highest for people aged 20-30, I’m 16. This problem is extremely close to me. 1619 is the first time Africans were brought onto American Land. Mass incarceration is used to describe what has been happening in the United States for the past 40 years, but the origins of this problem date all the way back till the first time a slave was brought from Africa and stepped onto American soil. As argued in the Documentary, 13th, Mass Incarceration is an evolved form of slavery that is a direct result of the 13th amendment. But oh wait, I thought the 13th amendment abolished slavery. I thought it freed all slaves and gave them the life they deserved. Now, the 13th amendment did outlaw slavery but it had one huge exception. Slavery was not allowed unless as a form of punishment for a crime. And like that almost, instantly blacks in America were charged with minor crimes and put back in the position they began. Furthermore, Southerners found ways to enslave even more blacks. They created what we call now as black codes. Black codes essentially were laws that were made up to specifically criminalize blacks. For example, all free men were required to have a job. Blacks, who formally were slaves, got thrown into a new world with no adjustment time. It was so hard for them to find a job without knowing how to read or write or even having an education at all. On top of that most workplaces in the south were segregated and there was barely any jobs available to blacks. When blacks were found guilty of these criminal offenses they would be sold to the highest private bidder to do work for them. This was called convict leasing and during this time incarceration grew by ten times the previous amount (The Evolution). Eventually, blacks codes were outlawed along with segregation, mostly due to the civil rights act of the 1950s. Despite the amazing strides made by people like Martin Luther King Jr, Rosa Parks and tons of other people, black men to this date still have a one in three chance of going to jail. Most of these “criminals” are charged with non-violent crimes that are usually drug-related. The war on drugs, as many have called it, has disproportionately affected the black community. The prison population grew from 218,466 in 1974 to 1,508,636 in 2014. That almost 600% increase completely tramples the 51% increase in total US population since 1974. Slavery has evolved from being out and blatant to being protected by laws now. This is the modern slavery. Historically, Slavery has been an instrumental part of the American economy by originally providing free labor. This evolved form of slavery is continuing to be a big part of the economy. Somehow everything in America turns into a business. And that is what private prisons are. Although private prisons only house 131 thousand prisons compared to the 1.4 million prisoners in government prisons, they consistently lobby for longer prison sentences. Why, well because they profit. 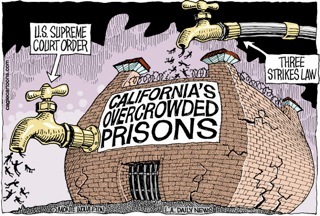 The boom in incarceration has also caused an increase in the companies that provide goods and services for prisons. But these companies don’t exactly work in the most tasteful way. Such as, the prison phone industry, which is estimated to earn $1.2 billion per year and is dominated by several privately held companies. The price of phone calls along with other services has skyrocketed with short phone calls costing up to fifteen dollars. This is because the companies are basically monopolies within prison walls. These private companies also offer state and local authorities a percentage of their revenue. This system that the government is allowing only hurts poor people by taking their money and giving it to private companies. You had a great depth of info spanning a wide field. The style of your work brings to mind the documentary “the 13th” in its insightful commentary and deep evaluation of prominent social issues. The visual aids were great in both conveying your point and drawing in the reader. My only suggestion would be to include a “Works Cited” section so that the reader can better their own knowledge of the information, should they so choose. It is so upsetting to me that a topic like this still needs to be addressed. I thought you did a wonderful job with such a challenging topic. It saddens me that slavery is still in use because people do not know how to function without others doing hard work for them. Hi Andres, you tackled a very difficult subject, and I truly enjoyed reading about how slavery may have shifted forms, but has never truly left us. Your explanations were very insightful, and I actually argued a Mock Trial case this year involving a private prison, so that portion especially was very interesting to learn about. The statistics and images you included are also super powerful, and I just have one question: How would you define slavery? Since slavery has changed pretty drastically from the form it appeared in in the past, has the definition of slavery changed at all? Wow great project! I love that you focused on this topic. My grade went on a field trip earlier this year to a plantation and the guide said that America’s economy needed slaves so if they weren’t African American they still would have had slaves. I think that’s what prisons are doing. They are making slavery possible again to better Americans economy. I was wondering what you thought about slavery in other countries? You did a great job of expressing such a large problem in America. I don’t know if you’ve ever heard of the book Just Mercy by Bryan Stevenson, but it’s about mass incarceration. We had to read it for school and it reminds me a lot about your project. Thank you for raising awareness on this! I think you did a really great job on this project! America’s disproportionate prison population has been a hot topic at my school recently and we recently heard a senior speech that talked about how the War on Drugs was basically a war on black people. I think it is impossible to claim that we have truly obtained equality here in this country. In the wake of slavery, we have only found less obvious ways to punish the minority population. However, do you see us making progress in the future? Overall i think your project is very good and informative! My only comment would to be possibly add more color just to keep readers that may be on the fence interested. The project itself is very powerful!